Hampton Inn Roanoke Rapids, which opened in June 2008 with 126 beautifully appointed rooms, has that certain something that makes a great hotel. In their case, we call it “Hamptonality.” That “Hamptonality” led the hotel to become a Circle of Excellence award winner for 2009 and 2010 and Wall of Fame award winner for 2009, 2010, and 2011. 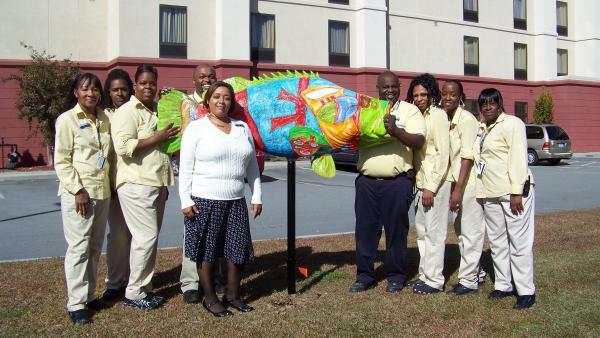 Their “Hamptonality” is also showcased in the beautiful rockfish, painted by local artist Jane Deese. The fish is ready for bed or a relaxing morning at Hampton Inn, He is wearing a robe and sleeping mask. Under one fin, he has a luxurious Hampton Inn pillow. In the pocket of his robe is the television remote for leisurely channel surfing. On another fin is a helping of Hampton’s delicious breakfast. All of these comforts mean that whether you are a fatigued fish or a tired traveler, Hampton Inn will make certain that your stay is a comfortable and relaxing as possible.